Building on the collaboration between REACH and the Camp Coordination and Camp Management (CCCM) cluster in Iraq throughout 2014-15, REACH has been partnering with the IOM Displacement Tracking Matrix team, camp managers and the CCCM Cluster in South Sudan since June 2015 to regularly produce standardised information products across the major displacement sites in the country. 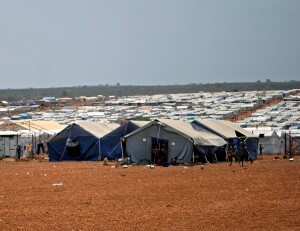 Since December 2013 when civil war broke out in South Sudan, REACH has supported camp coordination and management by conducting regular site mapping, shelter and intentions assessments and representing the cluster for Initial Rapid Needs Assessments in parts of the country where humanitarian access is particularly challenging. REACH has recently produced site snapshots for the 3 different Protection of Civilians (PoC) sites at UN House in Juba, PoC 1, PoC 2 and PoC 3, which provides key information about the population of each site, together with its performance against key indicators for each sector. An overview profile of UN House Sites provides a comparative overview of conditions across all three sites. REACH has already released factsheets for Mingkaman informal site, and PoC sites in Bor and Bentiu. REACH will soon also publish similar snapshots for the other major displacement sites in South Sudan, including PoC sites in Malakal and Melut. “The REACH-CCCM site profiles have been very useful for presenting to donors and dignitaries visiting the different POCs in UN House to give them an overview of the site, and to highlight key hot topics and challenges experienced across the different sites.” explains the Camp Manager of the UN House Site, “REACH maps have also been very useful for site planning of new infrastructure and as a reference when discussing issues with camp stakeholders”. Currently the REACH and CCCM teams are looking into further research regarding topics around the intentions and perceptions of displaced houesholds involved with volunteer re-integration programmes in some of the major displacement sites in South Sudan. Image: UN House PoC 2.